What Makes Santa Fun Runs So Great? Santa Fun Runs are great fundraising events because anyone can participate in a short run. 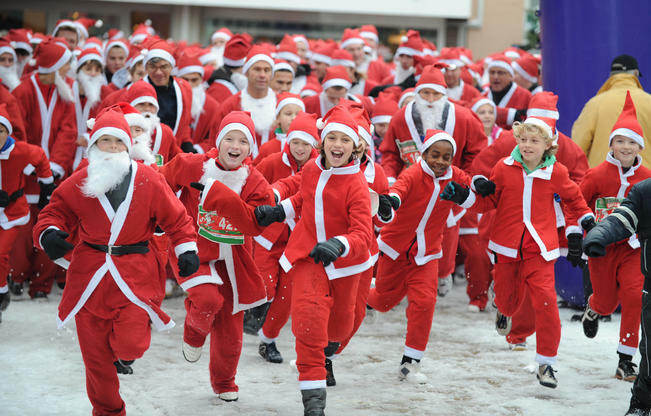 Santa Fun Runs are simple to promote and attract sponsorships. Santa Fun Runs create fun competition and create great camaraderie. Santa Fun Runs are creative (COSTUMES!) and a fun way for people to show their HOLIDAY spirit. A successful Santa Fun Run can raise 10000’s and even 100000’s in donations. The effectiveness of Santa Fun Run fundraisers is not a secret that is why so many organizations create their own. If you want families, kids, adults, and sponsors to be enthusiastic, then it should be a great event and not just a ho-hum event. Great food, shirts, prizes, photo-booths, brewery/restaurant stops, music, etc. are all components of a great and memorable event. To be successful with your own Santa Fun Run, make it different and unique. Be sure that your Santa Fun Run software is flexible enough to have features that support your own unique needs. Blue Sky Collaborative creates Santa Fun Run fundraising software. Our SWEET! Santa Fun Run fundraising platform is ideal for any non-profit or company that holds pledge-based events like bowl-a-thons, golf-a-thons, run-a-thons, any-a-thons. The company was founded in 2002.